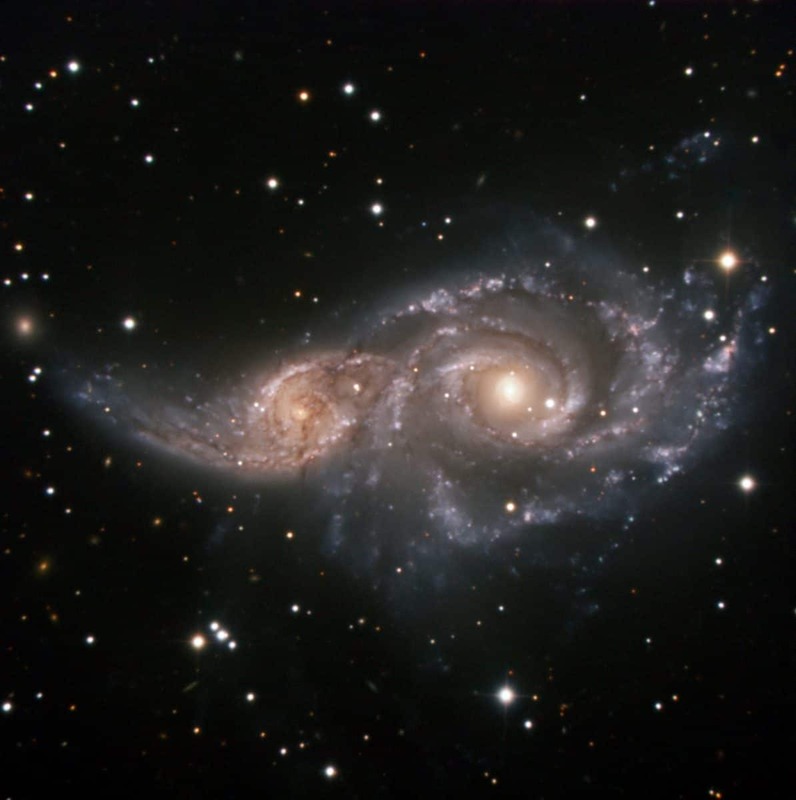 In this image, two spiral galaxies, similar in looks to the Milky Way, are participating in a cosmic ballet, which, in a few billion years, will end up in a complete galactic merger — the two galaxies will become a single, bigger one. Located about 150 million light-years away in the constellation of Canis Major (the Great Dog), NGC 2207 — the larger of the two — and its companion, IC 2163, form a magnificent pair. English astronomer John Herschel discovered them in 1835. The fatal gravitational attraction of NGC 2207 is already wreaking havoc throughout its smaller partner, distorting IC 2163’s shape and flinging out stars and gas into long streamers that extend over 100,000 light-years. The space between the individual stars in a galaxy is so vast, however, that when these galaxies collide, virtually none of the stars in them will actually physically smash into each other. This image was captured with the ESO Faint Object Spectrograph and Camera (EFOSC2) through three wide band filters (B, V, R). EFOSC2 has a 4.1 x 4.1 arcminute field of view and is attached to the 3.6-metre telescope at ESO’s La Silla Observatory in Chile.